Sparkling Vintage Habits: Rise and Shine! Last week I kicked off this little habits series with “getting a good night’s sleep” for good reason: to get your reading to experience a Sparkling Vintage morning! Oh no, I can hear you groaning, she’s going to ask us to get up early! I’ll confess up front that I am a morning person. I wasn’t always that way–in fact, family members will attest that I used to hate early mornings, especially as a teenager and young adult, but usually that was because I was burning the proverbial candle at both ends. For the past twenty years or so, I’ve found mornings to be the best, most productive part of my day. 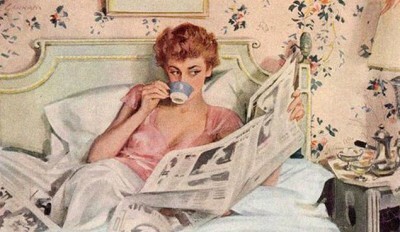 So what’s so vintage about getting up early? Pretty much the same thing that’s vintage about getting a good night’s sleep–it’s in keeping with the natural pattern of daylight and nighttime that the human body is designed to work with. It involves slowing down, even for an hour, the rush-rush pace of modern life. Mornings are full of optimism–remember Ronald Reagan’s chipper phrase, “It’s morning in America“? Don’t get me wrong–this is not a sermon about the virtues of rising early. If you’re a natural night-owl or a shift worker, getting up early might be sheer torture for you. I’m not talking about a specific time of day–it’s about how you use the first few hours of your day, whenever they may fall on the clock. If your “morning” starts at 1 p.m., then merely adjust what I’m saying to suit your schedule. If you get a good night’s sleep, the time on the clock doesn’t really matter. It’s your attitude that matters. The point is to try to rise early enough that you move through your daily preparations at an unhurried pace. There’s absolutely zero elegance in racing around like a mad fiend because you’re late and the kids are hungry and you can’t find your car keys and you really should exercise but there’s no time, no time to say hello, goodbye, you’re late, you’re late, you’re late (to paraphrase the White Rabbit). Okay, that we’ve gotten that out of the way . . . While reading Daily Rituals: How Artists Work by Mason Curry, I was inspired by the many creative, prolific individuals who did their best work within a few hours of rising, including Henry James, Igor Stravinsky, Somerset Maugham, Graham Greene, Maya Angelou, P. G. Wodehouse, Franz Liszt,Franz Schubert, Flannery O’Connor, Victor Hugo, Nathaniel Hawthorne, Mark Twain, Willa Cather, and Charles Dickens. These days my morning routine includes making coffee, reading the Bible, praying, writing in my journal, exercising, and getting myself ready for the day. My husband and I also spend an hour together, drinking coffee, reading aloud, praying together, and just talking. This simple routine starts my day off on the right foot. And the nice thing about having a routine that’s pretty much the same every day is that I don’t have to think too hard. I just do it, and by the time I’ve finished, I’m energized and ready to begin the day. The specifics aren’t important. Your morning routine might look completely different from mine. The point is, are you making the most of the earliest hours of your day? Are there things you could do to make them more peaceful and productive?